Miami Children’s Health Foundation, the fundraising arm for Miami Children’s Health System, celebrated the success of its Together For The Children Campaign on Thursday, October 13 with more than 300 guests in attendance at a special preview unveiling of the Advanced Pediatric Care Pavilion (APCP), a new six-story tower within the campus of Nicklaus Children’s Hospital. The construction of the new 212,000 square-foot state-of-the-art family centered facility, was one of the priorities of Together For The Children, which surpassed its original fundraising goal of $150 million, two years ahead of schedule. The structure is the first freestanding pediatric facility of its kind in South Florida, dedicated to the care of children with complex and specialized needs. 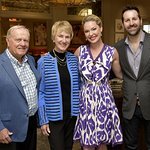 First Family of Golf, Jack and Barbara Nicklaus, Chairs of the Together For The Children Campaign were on hand for the ribbon cutting alongside Dr. M. Narendra Kini, CEO for Miami Children’s Health System, Mario Murgado, Board Chair for Miami Children’s Health System, Alex Soto, Board Chair for Nicklaus Children’s Hospital and Marile Lopez, Board Chair for Miami Children’s Health Foundation. 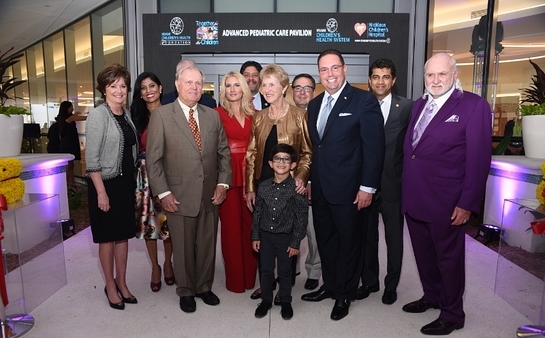 The event also served as backdrop for the announcement of a $1.5 million pledge from West Coast University in support of nursing education at Nicklaus Children’s Hospital. This generous gift demonstrates the joint commitment to nursing education, which will ensure the continued delivery of nursing care to children through family-centered bedside manner. During the program, Carlos A. Gimenez, Miami-Dade County Mayor presented a certificate of appreciation to mark this historic occasion. Also in attendance were State Representatives Frank Artiles, Jose Felix Diaz, Alex Ferro, and Erik Fresen, Commissioners Steve Bovo and Jose “Pepe” Diaz, Secretary of the Agency for Health Administration Justin Senior, School Board member Dr. Martha Perez, and MCH Foundation Celebrity Ambassador Erick Cuesta. The new facility is making possible the relocation of Nicklaus Children’s Hospital’s three internationally recognized intensive care units (Cardiac Intensive Care Unit, Neonatal Intensive Care Unit and Pediatric Intensive Care Unit) to a new state-of-the-art setting, enhancing the care environment and offering additional family-centered amenities. For more information about the Together For The Children Campaign please visit www.mchf.org/donate or contact Lisbet Fernandez-Vina at 786.268.1845 or lisbet.fernandez-vina@mchf.org.